Eurelectric – Powering People - "The future is electric"
On 10-11 September, come and find out how electricity utilities today are reshaping our energy system for tomorrow: making it cleaner, more innovative and closer to customers. 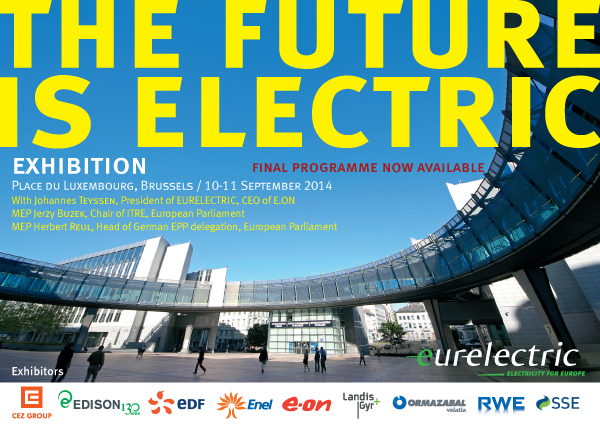 As the new European Parliament takes up its activities, EURELECTRIC invites you to a major exhibition outside the European Parliament, featuring smart metering applications, electric cars, CCS demonstration projects, and much more. Exhibitors include EURELECTRIC member and associate companies CEZ, EDF, Edison, ENEL, E.ON, Ormazabal, Landis+Gyr, RWE, and SSE. Join us for two days of networking with energy experts from across the industry. The exhibition will be complemented by a series of short debates on key energy issues throughout the day. A cocktail took place on 10 September with MEP Jerzy Buzek, MEP Herbert Reul and with Johannes Teyssen, President of EURELECTRIC & CEO of E.ON.